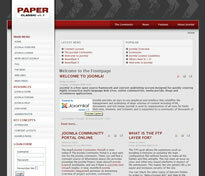 There is a new Joomla themes provider and they're called Joomla 51. They've opened up with a few themes and the latest is called paper Classic 1.1 and you can see a demo here. The thing is with theme providers these days is there are so many and you can pretty much split them into two camps; clubs or single purchase. This one is a site where you can buy single themes for as little as $14. I like both types of provider and use both clubs and single purchase providers - but with so many out there, it can take a lot of looking around. I've not played with one of these themes before so my job is to simply point you in the right direction. Be warned however, there doesn't seem to be a support forum so you may be reliant on the developer if you run into problems. Anyway, click here for more information and to visit the site.